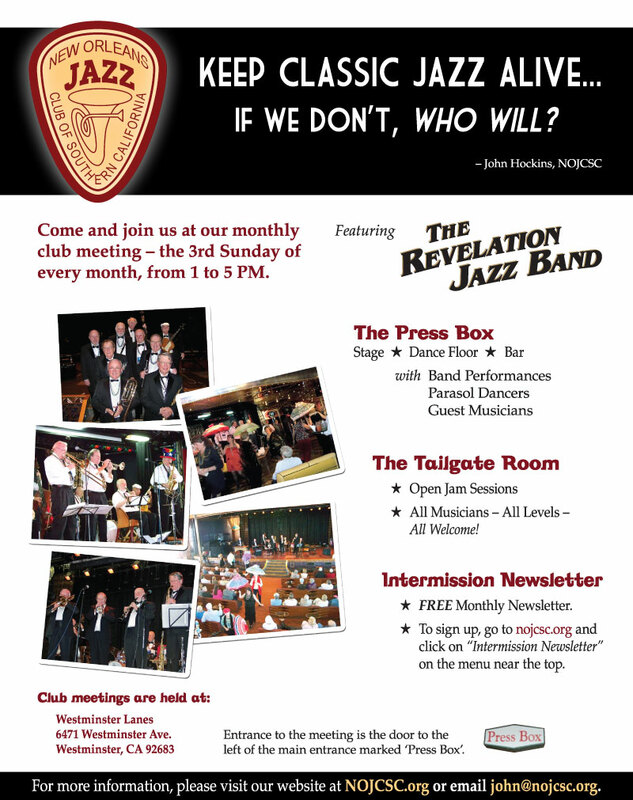 Please join us at our next Club meeting on Sunday, August 18, 2013 at the Press Box at Westminster Lanes, Westminster for an entertaining afternoon of Traditional Jazz and Swing featuring the Revelation Jazz Band and Club Musicians performing all afternoon. 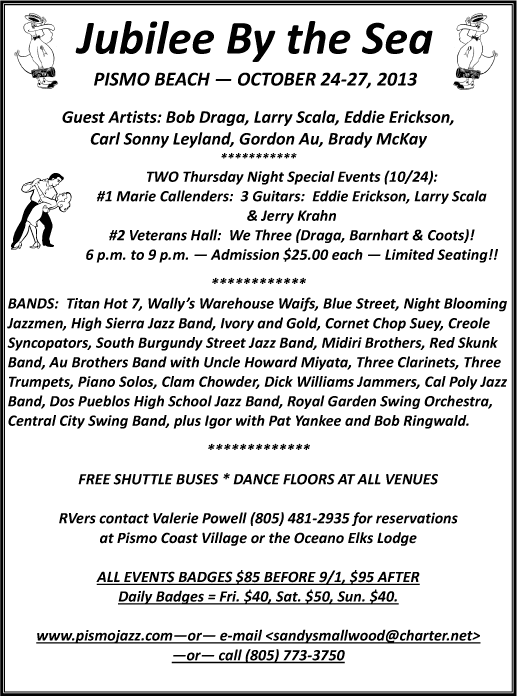 The Club also offers to members a “Tailgate” room set aside for musicians of all ages and skill levels to practice their instruments with direction from accomplished musicians. At the July meeting we were treated to Corey Gemme’s Dixiebop Quartet — talented musicians playing a wide selection of Jazz and Swing and brilliantly led by multi-instrumentalist Corey Gemme. Thank you Corey! For more information visit their website: www.coreygemme.com. The board of directors is delighted to announce that Steve Tyler has joined the management team as Editor of the Intermission, with special responsibilities in the development of young musicians. Steve recently returned to Southern California after several years performing and teaching in the Midwest and in the San Francisco Bay area. 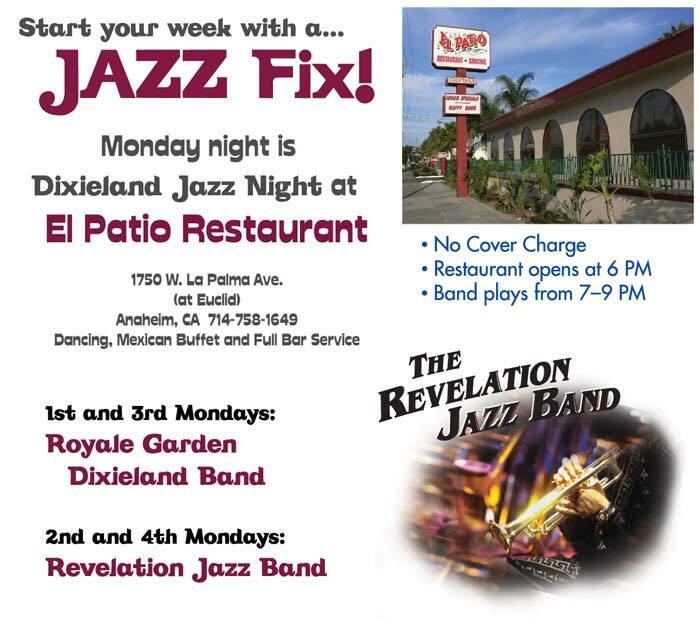 He currently performs with Corey Gemme’s Rolling Figs Jazz Orchestra, and is a former trombonist with the Hot Frogs Jumping Jazz Band, Janet Carroll’s Hollywood Jazz Cats, and as a sub for many festival bands. He taught jazz ensemble and improvisation classes for the past 13 years at De Anza College in Cupertino, and has a wealth of experience as a professional musician and music educator. One of the goals of the NOJCSC is to find ways to help perpetuate the wonderful American art form known as “classic” or “traditional” jazz. The goal of the group would be to become a true performing ensemble, able to play at jazz clubs, community events and jazz festivals, as well as self-contained, where the students will not need an adult to direct them during performances. We will be looking for young instrumentalists, from junior high to high school age, to get the group off the ground. If we find enough interest, we will announce rehearsal and audition information. The plan is to meet at the Tailgate Room two or more times per month. If you are interested, or know of any students or parents who may be, please contact Steve Tyler at steve [at] nojcsc [dot] org. If you have any questions or would like to try your hand at editing this newsletter, please contact NOJCSC President John Hockins at john [at] nojcsc [dot] org.